Scott and Jannine Fitzgerald knew that they wanted to read children’s books to their son about bike riding and living an outdoorsy lifestyle. The problem was, there weren’t many books on those topics. So they decided to write one. Scott says they were confident that their experience as bike shop owners in Victor, Idaho would help them along the way. “Running a bike shop you do a lot of things yourself,” he says, “if we can make t-shirts, hats and sweatshirts, why can’t we make a children’s book?” Turns out, they could. 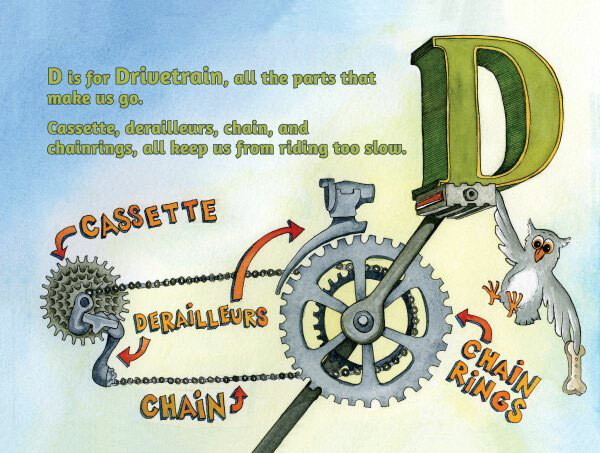 The book (which you can order online) associates each letter of the alphabet with a different bicycle-related item. From parts (D is for drivetrain), to infrastructure (S is for singletrack), to safety (H is for helmets) and beyond. Scott says that the letters L and Q gave them the most trouble but that otherwise the limericks came to them pretty easily. To make the idea a reality they hired Kathleen Hanson, a graphic designer friend to do the illustrations, and launched a successful Kickstarter campaign. In the last year, writing a children’s book isn’t the only big change for the Fitzgeralds. They also recently sold their bike shop, a decision that will allow them to focus full time on advocacy. Their next project is a sequel to “B is for Bicycles,” in which the main characters (who are based on their dogs) open their own local bike shop. The books are also just the first part of their strategy to get as many kids on bikes as possible. “We want to have more of a national impact surrounding children’s cycling” Scott says, “We’re really passionate about mountain biking and connected pathways and tourism, but if we don’t have kids getting into the sport, nothing else matters.” If everything they do turns out as well as this book it will be E for exciting to see where they go from here. > And the #1 kid biking city in our nationwide challenge is?